The Boswell family was forced to remove everything from their home for disposal after the flood receded. A young woman walks through her flooded home. Her belongings swim in the water sloshing around her ankles. Her gaze wanders from one destroyed belonging to another until it settles on a small shoe. Her son’s first. When she leaves her home, she is not just leaving her photographs, toys, heirlooms or clothing–she is leaving her memories. Krislyn Wurtz Boswell, a 2010 Canyon High School graduate and former editor-in-chief of The Eagle’s Tale, moved to Dickinson, Texas, after graduating from nursing school. She now works in labor and delivery for Clear Lake Regional Medical Center and is in graduate school working toward her nurse practitioner degree. 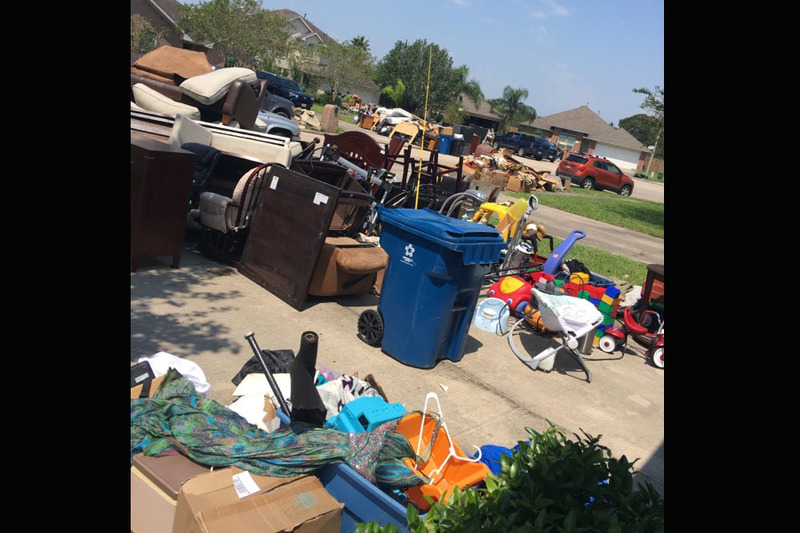 Her home, along with all of her family’s belongings, were destroyed after Hurricane Harvey hit. Boswell and her husband bought three cases of water, some non-perishable food and two battery operated flashlights before the storm came. 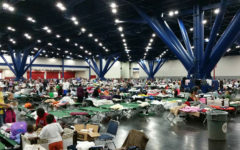 When the hurricane struck, Boswell was called to work as part of the hospital’s Disaster Relief Team. 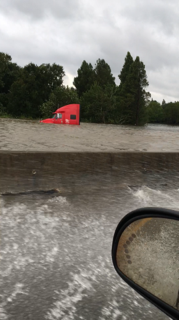 Flooding in Houston stranded motorists after Hurrican Harvey hit. Boswell said the B-team would take over for two to three days to allow the A-team to go home, rest, assess the damages and then return to their normal schedules. Although her husband and two sons went home, Boswell stayed at the hospital for six days. Boswell said she was torn between doing her job and missing her boys and husband, Jace, who is a 2009 graduate of Canyon High School. Almost all of Boswell and her family’s belongings were destroyed, but her husband and children were rescued when they were picked up by a dump truck. Boswell said her family lost everything, but other families lost more. Since her home was destroyed, Boswell has been living with her mother in Houston. While driving through her community, Boswell said she saw trash piled up on the streets. 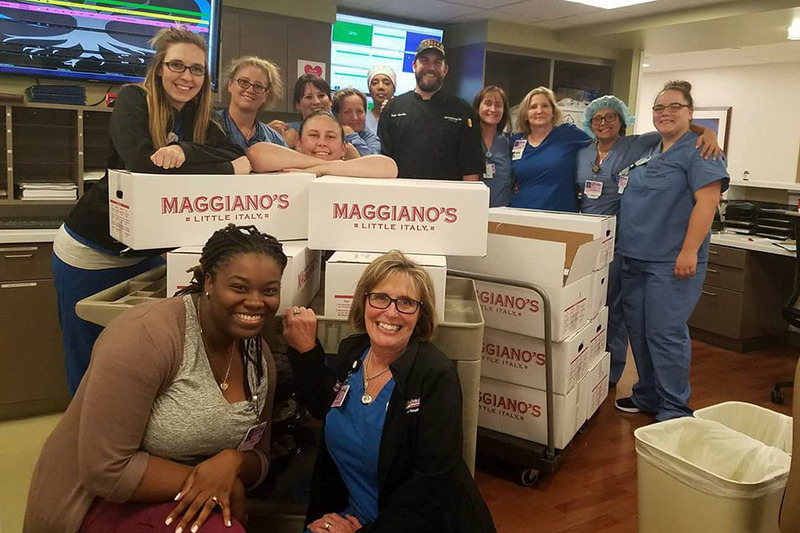 Krislyn Wurtz Boswell, back left, takes a dinner break at the Clear Lake Regional Medical Center after a local restaurant donated meals for the staff, who did not leave the hospital for six days. Boswell said everything at her house is gone. Friends, family and strangers helped the Boswells after their home flooded. 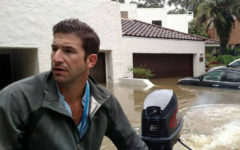 The Federal Emergency Management Agency has been helping families, but Boswell said she doesn’t know what will happen when their assistance stops. As a nurse, Boswell said her training prepared her for the disaster. Staying strong for her children helps Boswell face daily challenges. Boswell said the community has come together through this tragedy.